I didn’t want to hear my face was big anymore. I worried about my big cheek bones. So I always covered my cheeks and jaw with my hair. When I took a picture, I covered my cheeks and jaw with my hair. I had to think about that at lot. When my friend took a picture of me, I used to delete them because of my cheekbones. but because of my prominent cheekbones, I couldn’t do it. I didn’t have chubby cheeks so my cheekbones looked bigger. And I realized I didn’t have confidence. I decided on surgery so I can be confident about myself and in front of others. 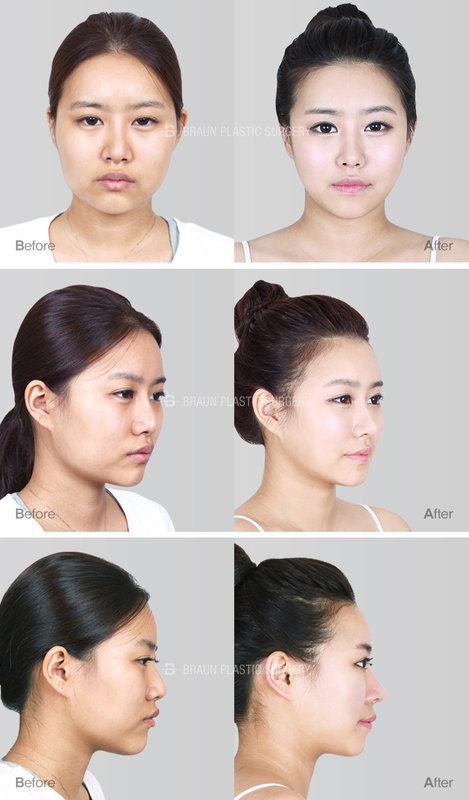 She had a rhinoplasty before but her nasal bridge was deviated and the tip of her nose was wide. Her cheekbones were wide and her jaw line was asymmetric. Her face looked tilted and wide because of lack of volume. Confident lady no matter where! The biggest change for me is of course confidence! I stayed back whenever I took a photo with my friends before. But I don’t do it anymore. First of all, I like my sophisticated image. I became confident at every angle, not just one angle of 45 degree. I was nervous after deciding on surgery. But when I went to the clinic, I got to talk to my doctor about the detailed surgery method. 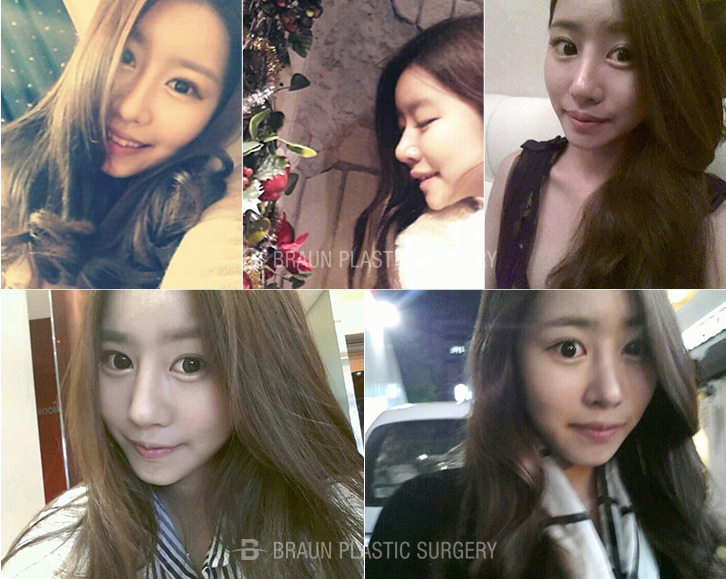 I was nervous because I had nose and contouring surgery together. so I could trust him and went to the surgery room more comfortably. When I woke up, I was in the recovery room. I checked the mirror and my face was swollen really bad. I thought it was not my face. The nurses came checking on me several times and cheered me up. The swelling was the worst on days 2 and 3. It was worse than right after surgery. I called the clinic a lot. I think the nurses were having a hard time convincing me. but I didn’t go outside. I was staying inside and went out to walk at night wearing hat. My face was so oily because I couldn’t wash my face but I endured thinking I would be pretty. This pain was nothing compared to my desire to be pretty! Swelling ! Go away! I had stitches in my mouth removed and disinfected. I was told the stitch removal was the worst but I could handle it. Also, I got my face cleansed and had high frequency treatment. I felt great. I was glad to just breathe through my nose. After a week, the swelling was going away. I could see my nose line and I did mouth exercises! In week 2, I could see my jaw line that was hidden by swelling! I could eat and it wasn’t hard to open my mouth. I still had swelling so my cheekbones were hidden but I was happy. I still had some swelling but I already love it. I look at the mirror every day! Talking a picture was so much fun. My friends who hadn’t seen me for a long time said the surgery was a good choice. They praised my face a lot! makeup like shading and highlighters. Now I put my hair up confidently. I didn’t know if this day would have come but it became my daily life now. For 6 months, I took a walk, had a hot pad massage and did mouth exercises diligently! Now when my friend asks me to take a picture, I am confident! I even pose. I needed Photoshop before, but now I just need skin tone correction only! Now my face is smaller than my Photoshop edited photo before. I am enjoying my happy daily life thanks to my doctors.